In the small amounts needed for seasoning food, you can safely add nutmeg to dishes and drinks, but unpleasant side effects occur if you eat just 1 tbsp. of the ground nut powder on an empty stomach, according to the Utah Poison Control Center. Recreational drug users looking for a cheap high occasionally ingest large amounts of nutmeg, triggering severe symptoms including nausea, burning pain in the upper abdomen and sometimes a feeling of impending doom. The spice called nutmeg comes from the ground seed of a tree found in the Spice Islands of Indonesia. The nut of Myristica fragrans or nutmeg provides two important spices, mace and nutmeg powder. Mace results from the ground aril or outer cover of the nut. You can make fresh nutmeg spice by rubbing the oily whole seed over a grater. Nutmeg spice has a 2,500 year culinary history, but only reached Europe during the Middle Ages. The first reported case of nutmeg intoxication may date to 1576. Nutmeg poisoning became more common from the 1960s onward as drug enthusiasts sought cheap legal hallucinogenics. Fats and oils in nutmeg contain thousands of unidentified chemical compounds. Among the known compounds in nutmeg are an odorless fat called trimyristin and a volatile oil called myristicin. What you smell when you grate nutmeg onto a dish comes primarily from myristicin, elemicin and safrole. 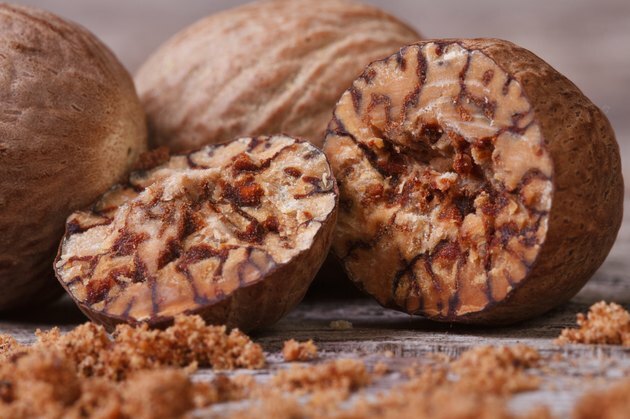 Myristicin causes the hallucinogenic effects of nutmeg, which some users compare to LSD. Myristicin also resembles amphetamine in effect. Myristicin causes stronger symptoms in combination with nutmeg's other volatile ingredients but myristicin oil sold for aromatherapy uses also presents a toxic hazard. If you swallow the oil you could experience convulsions, anxiety, drowsiness or delirium -- as well as several days of hallucinations. Exactly how much nutmeg you can tolerate before becoming ill depends partly on your body mass. In one case, an eight-year-old child ate just 14 g of nutmeg and died from the effects, according to A.K. Demetriades, M.D., of University College London Hospital. From 1 to 3 tbsp. of nutmeg powder, or 1 to 3 whole nutmeg seeds, causes illness in most people.The drug's effects begin 2 to 6 hours after ingestion, and the delay causes some users to take an extra dose. After effects of unpleasant nutmeg experiences frequently include a long-lasting aversion to nutmeg, according to chemistry professor Tom Goodwin, M.D., of Hendrix College, Conway, Arkansas. If you swallow an unusual amount of nutmeg, or if you suspect nutmeg poisoning in someone you know, call your local Poison Information Center for help. Only cause vomiting if advised by a health professional, says the University of Maryland Medical Center. Nutmeg poisoning stimulates nausea and vomiting, so emptying the stomach usually happens on its own. Underlying heart conditions could transform an unpleasant illness into a life-threatening situation, so seek immediate medical help. Treatment includes administration of intravenous fluids to counter dehydration problems, and supervision during drug-induced psychosis. Most people recover.